Birthday Wishes for Stepdaughter: Second marriages don’t always have the perfect start. It may be hard to find happiness and love in a relationship which lacks foundation. Separation and divorce can sometimes make it difficult for mums and dads to get along with their stepchildren. But life always presents opportunities to build bridges and your stepdaughter’s birthday is one such chance. Apart from her favorite gifts, write a sweet quote on a greeting card to let her know that your bond is much more than just superficial. Don’t assume that your stepchild will never understand your emotions. Her maturity may amaze you and your words can have a strong impact on her perception about what you are as a person. 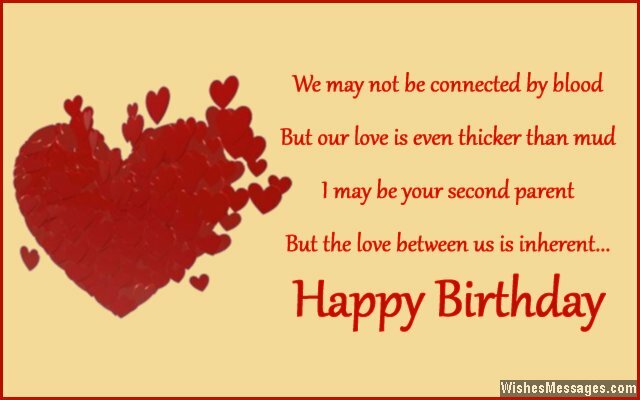 Make her feel special throughout her birthday week with cute Facebook posts and text message that connect you both on a deeper level. Even if you don’t get the kind of response that you expected, don’t give up. It takes time to fix relationships. Be patient and selfless – wait for the day when your stepdaughter realizes how much love you have in store for her. 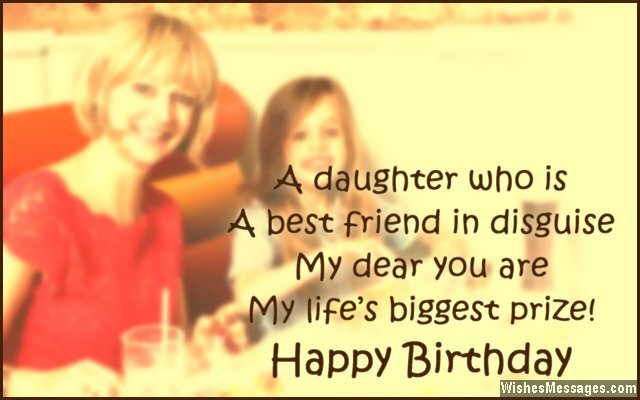 1) A daughter who is a best friend in disguise – my dear you are my life’s biggest prize. Happy birthday. 2) Our relationship may have come with a prefix called STEP – because it is meant to be beautiful every STEP of the way. Happy birthday. 3) I did not have the good fortune of giving you birth from my body, but I have the good fortune of keeping you inside my heart. Happy birthday. 4) To my dearest daughter… we may not be linked by DNA, but our lives are a celebration every day. Happy birthday. 5) Second marriages are full with anxiety, misunderstandings and stress. But because mine had you in it, everything was full of smiles and happiness. Happy birthday. 6) You could have been the force that caused fights between me and your father but instead, you became the glue that held us together. 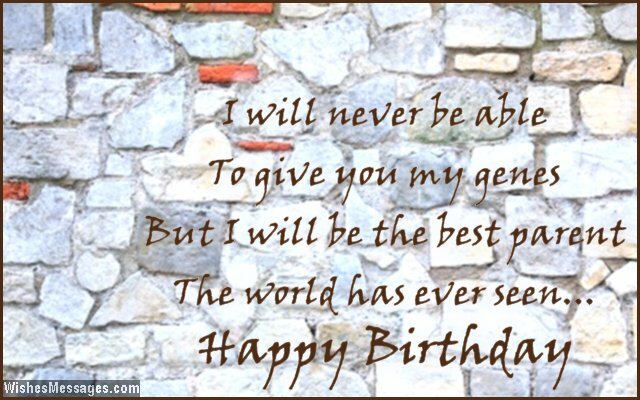 Happy birthday sweetheart and thank you for making the family stronger. 7) It doesn’t matter if I never experience the magical nine months of pregnancy, because I already have a wonderful daughter like you in my destiny. Happy birthday. 8) I feel like a queen because I have a princess for a stepdaughter. Happy birthday darling. 9) From the storms of a divorce and a second marriage, I never thought I’d make it through. But all the pieces fell into place, when I became a mom to a daughter like you. Happy birthday. 10) A stepdad is typically portrayed as a man who considers a stepdaughter as the baggage that comes with his new wife. But for me, you are the treasure that has brightened up my life. Happy birthday. 11) More than just giving me space in the house, you gave me space in your heart. More than just giving me the acceptance of a stepdaughter, you gave me the love of a best friend. More than just giving me the status of your new mom, you gave me the respect I deserve as a woman. Happy birthday. 12) Stepmothers have to put in effort to find reasons and ways to love their stepdaughters, but you have made me a natural pro at my job. Happy birthday darling. 13) The relationship of a stepfather and a stepdaughter is like a beautiful lotus which can only grow amidst the dirty waters of stress and strain caused by a second marriage. Happy birthday. 14) I may not be your biological father, but I love you like my own daughter. We may not have known each other forever, but our bond is something that I truly treasure. Happy birthday. 15) I will never be able to give you my genes, but I will be the best parent the world has ever seen. Happy birthday. 16) It is only after I became your STEPdad that I realized how I was just one STEP away from happiness all these years. Happy birthday. 17) The relationship of a stepfather and a stepdaughter is like a beautiful lotus which can only grow amidst the dirty waters of stress and strain caused by a second marriage. Happy birthday. 18) God might have made me fall in love with your father only so that I could become a mom to a lovely girl like you. Happy birthday. 19) From curious to anxious, nervous to afraid, worried to petrified – as I stepped into my second marriage and a new family, all my stressful feelings were negated by one single emotion that you gave me – love. Happy birthday. 20) You could have resented my presence in your father’s life, but you cherished it. You could have hated my involvement in your own life, but you valued it. You could have detested my addition in your family, but you welcomed it. Thanks, happy birthday. 21) Unlike others, we have been able to drop all our arguments, fights and disagreements because we dropped the word STEP from our mother-daughter relationship. Happy birthday. 22) If fights and distance make loved ones eventually come closer, let’s continue to fight. Someday it will make us the closest stepdad-stepdaughter in the world. Happy birthday. 23) The relationship of a stepmother and a stepdaughter is like sipping a quirky wine – it takes its own time to grow on your palette to eventually become your favorite. Happy birthday. 24) You could have made my life hell, but you made it heaven. You could have made each day a dull chore, but you made it a relaxing vacation. Happy birthday. 25) The best elimination that you and I have made is the deletion of the word stepdad and stepdaughter from the dictionaries of our lives. Happy birthday. 26) Instead of being a treacherous journey, my role as a stepmom has been a breezy walk – all thanks to a daughter as sweet as you. Happy birthday. 27) For me it isn’t blood or any kind of genetic material, which makes me the mother of a stepdaughter so special. It is the love of a daughter who is so sweet, that she makes my life seem like a wonderful treat. Happy birthday. 28) The blend of our family has been made perfect by a magical ingredient called my stepdaughter. Happy birthday. 29) Our relationship is like clay – it can change its form according to circumstances but it will always make us stick together. Happy birthday. 30) The best stepdaughters in the world are not the ones who accept their fathers’ new wives, but the ones who welcome them as new best friends in their lives. Happy birthday. 31) We may not be connected by blood but our love is even thicker than mud. I may be your second parent but the love between us is inherent. Happy birthday. 32) Fairy tales have always portrayed stepmothers as wicked. But for me, the only time I’ll get wicked is when someone else tries to be wicked with you. Happy birthday sweetheart. 33) The painful scars of a BITTER divorce were healed when I become a parent to such a SWEET daughter. Happy birthday. 34) In my second marriage I was expecting a lot of adjusting and compromising, but instead I found a daughter so loving and welcoming. Happy birthday. 35) I realized that my ugly divorce in the past was a blessing in disguise when I got a daughter as lovely as you. Happy birthday.